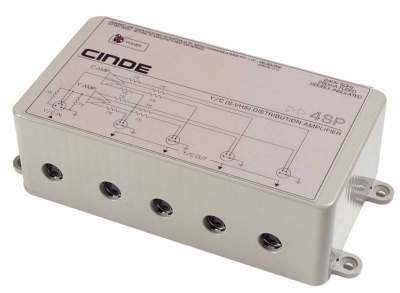 A general purpose 1-into-4 Y/C distribution amplifier for installation use. The compact ABS case has mounting flanges and block diagram on the cover. Designed with economy in mind, this is possibly the lowest cost S-VHS VDA on the market, but employs the same high integrity circuitry as our mainline products to ensure superb signal reproduction. Unity gain (terminated). Cinde is a registered trademark of Impax Communications Pty. Ltd.